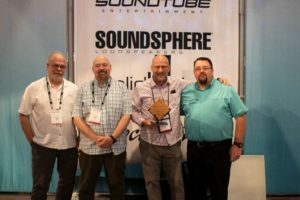 Overland Park, Kan. – June 18, 2018 – MSE Audio, parent company of SoundTube Entertainment, Soundsphere, dARTS, Phase Technology, Induction Dynamics, SolidDrive and Rockustics, is pleased to announce AVA Audio Video Associates as their commercial representative of the year. At InfoComm 2018, MSE Audio recognized AVA Audio Video Associates for their leading sales, customer service and support in the commercial market through the year. AVA Audio Video Associates is an independent manufacturer’s representative agency for professional and commercial audio, lighting and video products for Kansas, Missouri, Nebraska, Iowa and Southern Illinois. As a manufacturer representative, AVA Audio Video Associates directly reaches communications and lighting integrators, music and professional audio stores, and rental and production companies on behalf of MSE Audio.